You can leave the bed unmade. If someone forgets to invite you to something, he or she can still beyour friend. You can quietly watch a game with your buddy for hours without everthinking: "He must be mad at me. 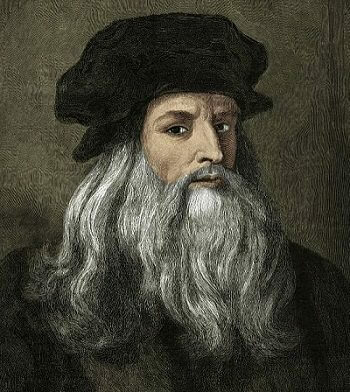 "Gray hair and wrinkles only add character. If another guy shows up at the party in the same outfit, you justmight become lifelong friends. Your pals will never trap you with: "So, notice anything different? "You know which way to turn a nut on a bolt. One wallet and one pair of shoes, one color, all seasons.Gas (at either end) is cool. 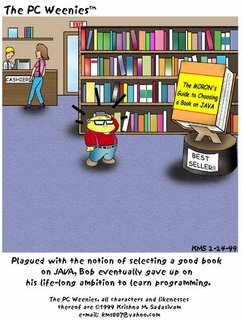 Got this from a great site i guess the cartoon really tells the truth about Java or should i say he just understand how difficult java for him to learn programming at first time? Another Programming Language had been served to us , and this time i somehow understand that learning new languages will improve a programmer efficiently. As i study this technology i read a book about "Introducing Microsoft.NET" by Platt. I don't know if he hates Java alot by making that book eheheh. But i understand the power of the .NET anyway. For me .NET is like a Java that became easy ! for a fact that every window GUI that you can see in some application can be dragged in the form. We are actually using Visual Basic 2005 Express Edition for amateurs or novices as they say. Anyway i know that only the tools are different when you have the Visual Studio 2005 package(in which i cannot find a pirated one here in the Philippines-lol). My major thesis will be using the .NET instead of the VB6 cause hey VB.NET together with ASP.NET would be great! So im self studying more about these .NET by reading books and looking around on the Web. The .NET technology is a great change for microsoft that they really wanted to be on top of other languages! Still i will be pursuing my Java and i should say that .NET would be second in command!